Carrie “Crazdude” Lindstrom is a self-taught artist who specializes in animal illustrations but is always up for a challenge. Self-taught in Photoshop painting and collage, colored pencil illustrations, and Prismacolor Marker illustrations. Her experience in the packaging industry came in handy for boosting her skills with Adobe Illustrator for vector-based illustrations, product labeling, and logo design. Her nickname Crazdude has been with her since her first email account when she was 10 years old. Of course, “CrazyDude” was already taken but she figured she didn’t need the “y” anyways. She’s known as “Craz” — which was meant to be pronounced “Crazy” — but often goes by “Crazz” or “Craze”. Her nickname was her screenname (or part of it) for nearly every website, LiveJournal, message board and so on. It’s good to be consistent so the name has stuck! She studied film and psychology at University of Pittsburgh and graduated from the Rochester Institute of Technology in the field of printing and graphic media. Her passion for drawing was evident since the age of 2 but she became more determined on her self-guided quest for improvement after joining Deviant Art during her college days. Since graduating, Carrie has illustrated a children’s book in her maiden name (Carrie Stariha) with plans to write her own children’s book stories paired with her own characters and illustrations. 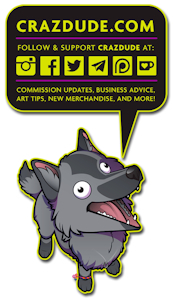 Shop - Prints, commissions, stickers and more!